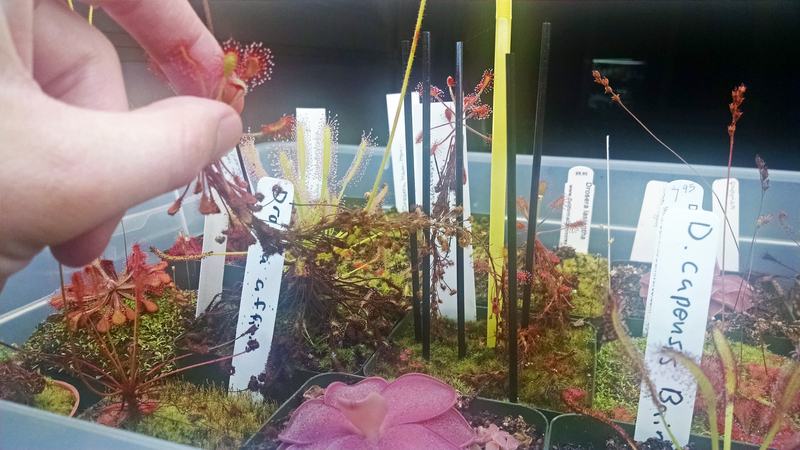 I noticed something very exciting today – my Drosera cistiflora is forming a stem! Reach for the stars little guy. It even looks like it's cheering, hahahah. I probably won't get flowers this year, but I'm very happy with this plant. It's become one of my favorites. D. cistiflora isn't the only stem-forming South African sundew. The most well-known is probably Drosera madagascariensis, which develops a scrambling habit very quickly. It's a jungle in here. In cultivation lots of people will chop them back and take stem cuttings. I haven't done that since I have neither the time nor the space and well, here we are. 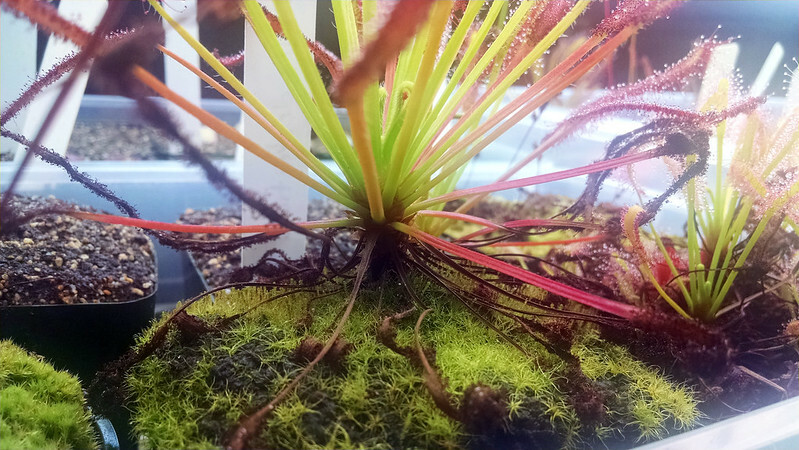 Our old friend Drosera capensis is also a stem-forming plant, though it stems out much more slowly than D. madagascariensis. I'd need to do some trimming to see the stem. This is a pretty neat plant. The first photo is my original D. capensis, which has a pretty respectable stem, but it's hidden by a clump of dead leaves and offsets. 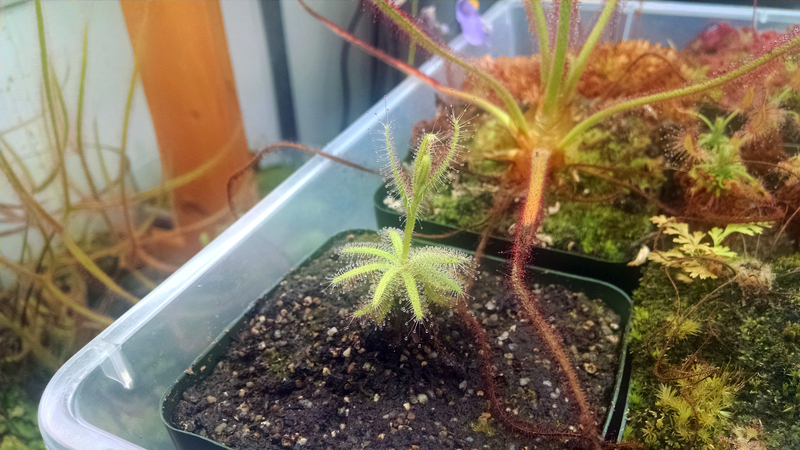 The lower photo, my D. capensis "broad leaf" is showing its stem a bit better. Drosera affinis is sort of intermediate between D. madagascariensis and D. capensis in how quickly it forms a stem. I have high hopes for that flower stalk. The very similar Drosera nidiformis is much the same, though mine has yet to start stemming out yet. Edit: As it turns out D. nidiformis does not in fact form a stem. I mis-remembered while making this post. Looks pretty good in any case. These should probably be in a larger pot. South African sundews are very cool. It's the first region that interested me, and it's one of least-studied. Fernando Rivadavia says that that's because we don't have a carnivorous plant expert in-country right now. If anyone in South African can read these words, go forth and study some plants. 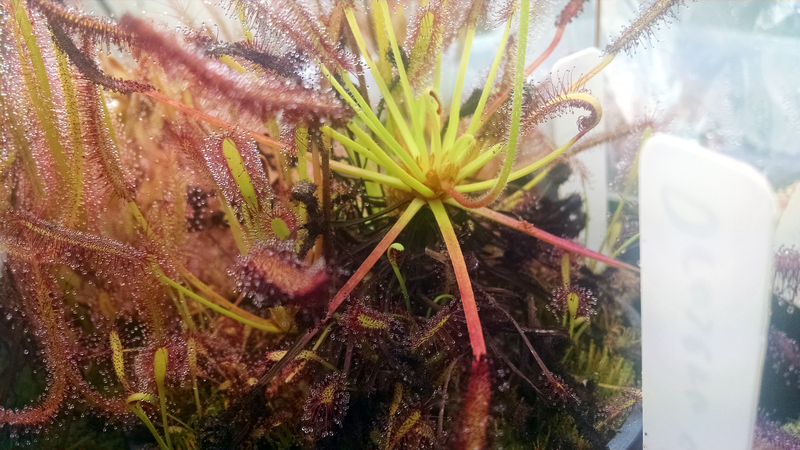 The stem-forming Drosera are my favorite! 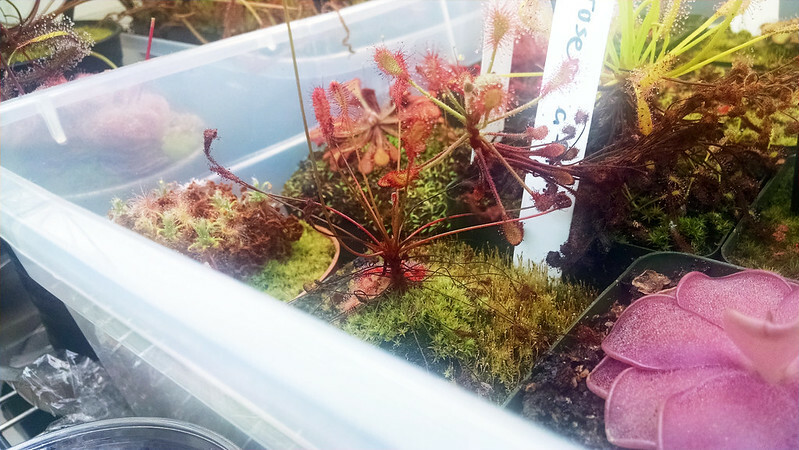 Are you sure Drosera nidiformis forms a stem though? According to growsundews.com it doesn't. You're right! Consider the post edited. 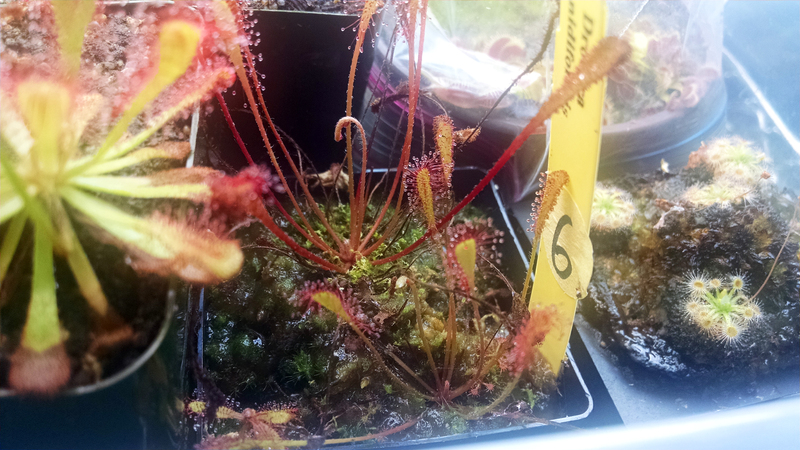 hey man; im about to buy utrics and been thinking to put into long square pot (full with capensis) at windowsill. can utrics + capensis live together in moist soil, or must be flooded? have no lamp, and tap water seems ok. muscipulas struggle in winter-some dies. capensis kinda hard to kill. even once forgot to water. reason wanting utrics is have some green covering the soil, no luck with moss....flowers could be a bonus. seller has bisquimata,livida which is better; (or is nicer to cover the soil)?